Slice of Pi Quilts: Gone Glamping! It is very fitting that my first quilt finish of 2016 is one to complete a challenge. 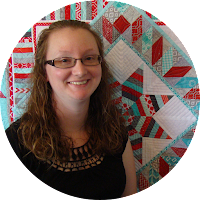 Michael Miller Fabrics and The Electric Quilt Company (maker of EQ7 quilt design software) teamed up this month to host a mini quilt challenge in celebration of EQ7's 25th year. The rules were just to use Michael Miller fabrics to make a mini quilt that measured 20" square or less. 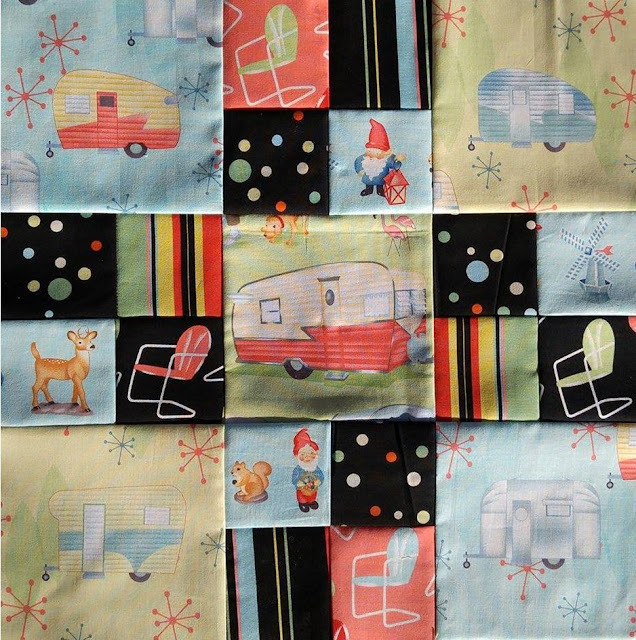 I hunted through my stash to find all of my Michael Miller fabrics, and kept coming back to my Vintage Camper fabrics. I have been "hoarding" them for quite a few years. I bought several of the prints at Nancy's Quilt Shop in northwest Las Vegas, NV before they went out of business. I bought several other prints at Prairie Flower Crafts in Alden, KS. I have never had a specific project in mind for the fabrics. 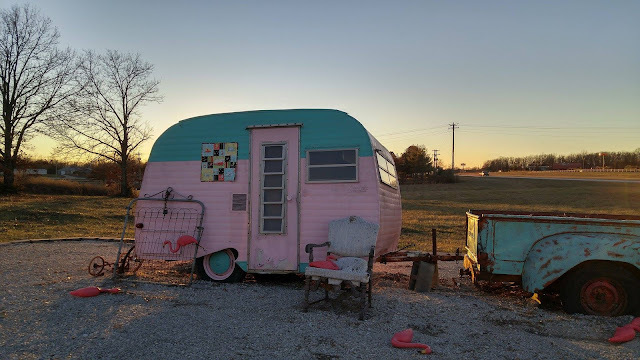 My husband and I owned a teardrop camper for several years BC (Before Children), so vintage campers hold a lot of appeal to me. I have about a yard of each print, so I have enough to make a good sized quilt. Someday. 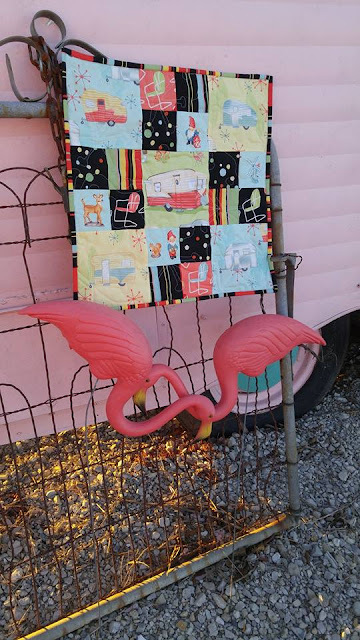 I wanted this mini quilt to highlight the camper fabrics and not be a distraction from them. This led me to choose a simple four patch pattern. 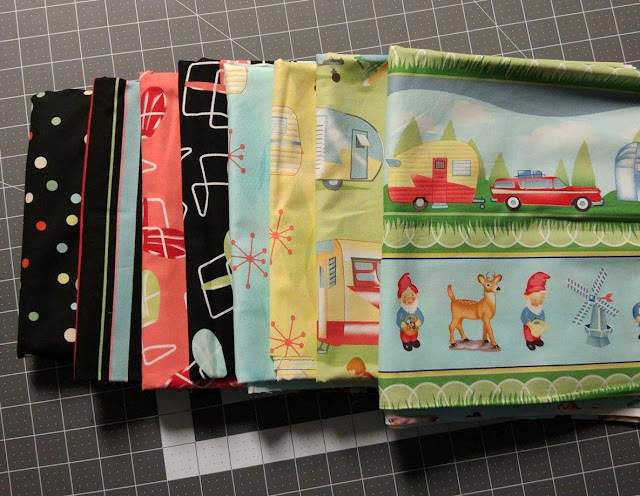 I fussy cut the Vintage Campers fabrics to make large squares (they finish at 6") and fussy cut the Vintage Chairs and gnome fabrics for the smaller squares (they finish at 3"). 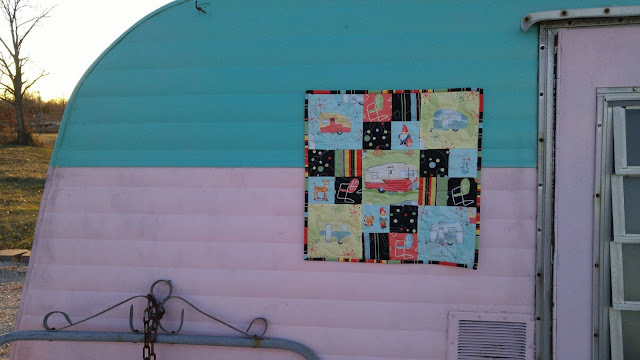 I used my Bernina Record 930 to free motion quilt a "jacks" pattern over the quilt (a similar design can be purchased here). I used the coordinating stripe fabric for binding. In our small town, we have a cute antique and boutique shop called E. Marie's. 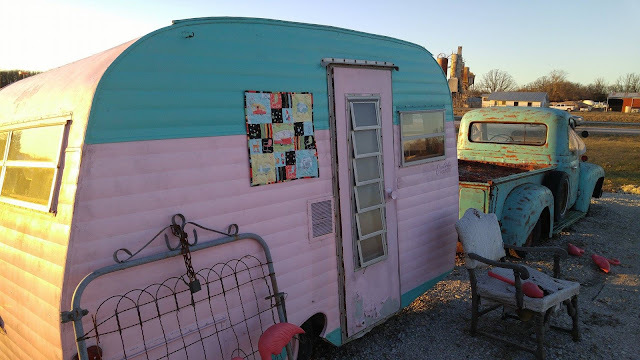 They have a vintage truck and camper in front of their store. I asked for permission to photograph the quilt there (awkward!). But the results were so worth it! I'll update this post as soon as I hear the results of the challenge. I did not win, but this was such a fun one! Check the hashtags #mmfMini and #EQ25 on instagram to see all the entries. Be sure to follow Michael Miller Fabrics and The Electric Quilt Company on instagram and Facebook too! 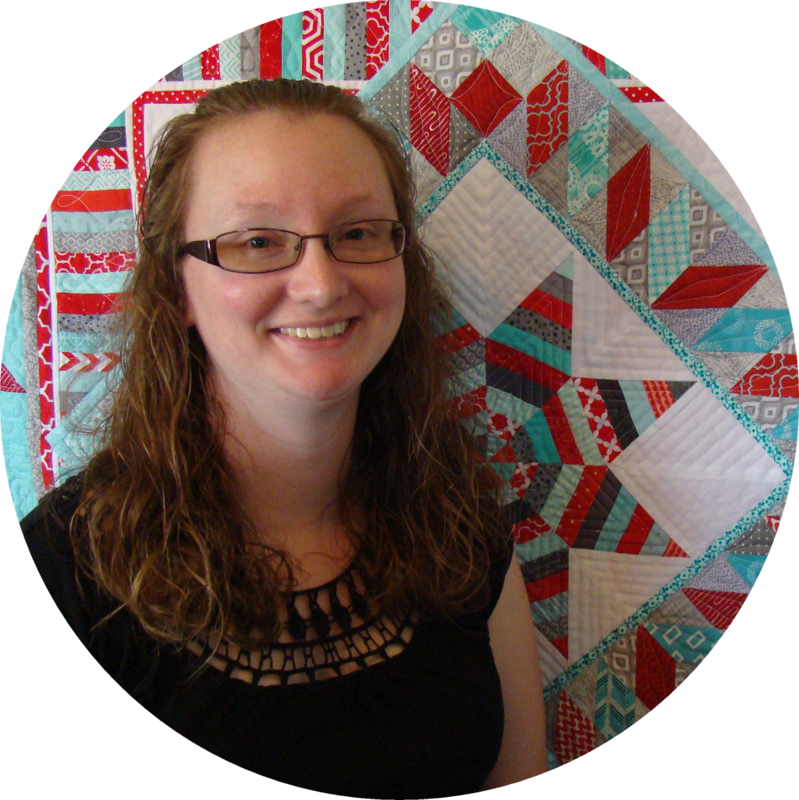 I am Slice of Pi Quilts on Facebook and @sliceofpiquilts on instagram. See you there! Love this great photo op, and the quilt! If only I had that truck near by to take pictures with!